The porcelain-coated cast iron cookery, originally called “Bruxelles Ware,” was first imported from Belgium in the 1940s. Descoware’s popularity soared in the 1960s: it was high-quality, hard-wearing, and very much in fashion. Descoware was preferred by Julia Child, and so advertised whenever Child extolled a Descoware pan on her TV show. (The photograph below shows Julia Child’s kitchen displayed at the Smithsonian Institution's National Museum of American History, with her Descoware bean pot set on the range.) Not only did it come in a bright rainbow of colors and beloved patterns, but Descoware was especially prized for its thin walls, meaning it weighed 1/3 less than its leaden competitors. In addition to the classic flame-colored Dutch Ovens and pans, this lot includes several examples of two popular patterns from the mid-1950s. The adorable “Markley” pattern features sweetly-stylized chickens, watermelons, radishes, and fish painted on sunny yellow, and the “Maple Leaf” pattern shows a sprig of red, orange, and green maple leaves dotted with brown to highlight the changing colors. 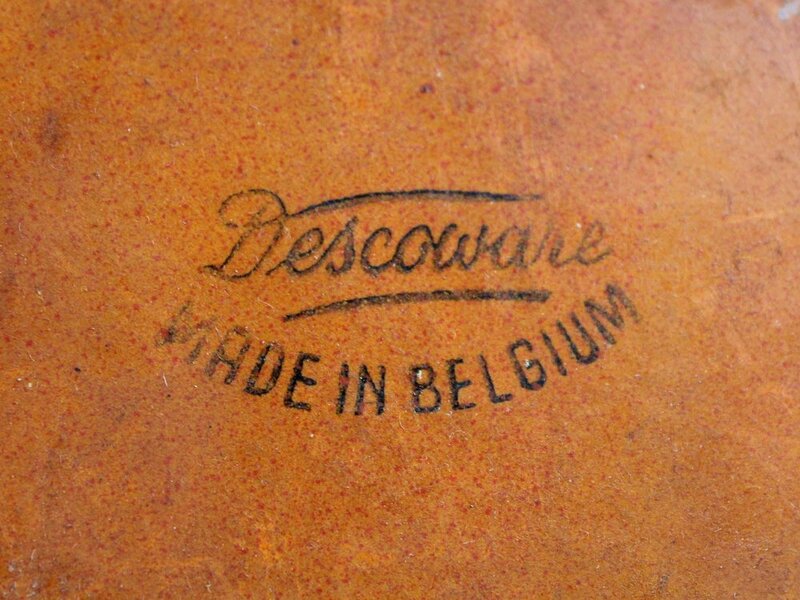 By the 1970s, domestic and international competition had eroded Descoware’s hold on the cast iron market, and the brand was absorbed by Le Creuset and discontinued. (Le Cruset’s current flame-colored pans are a more neon take on the Descoware standard.) This collection of top-of-the-line cookware is just as stylish today as it was over sixty years ago, collected and available to you through Hayloft April 11.